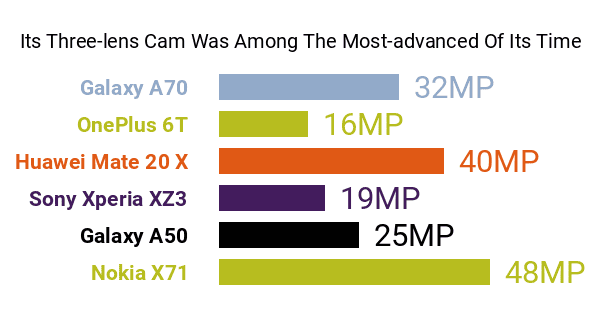 Primarily aimed at mobile photographers, the 2019 Nokia X71 lines up with some of the best smartphones for imaging listed here on Phonerated by touting a ZEISS-optics triple camera , which consists of a whopping 48-megapixel 0.8-pixel main lens, a 5-megapixel depth-of-field lens, and an 8-megapixel wide-angle lens that enables a viewing angle of up to 120 degrees. Its three-lens system is decked out with a dual high-CRI LED flash and AI scene recognition. Despite that huge pro on the imaging front, though, our thorough review of its specs still revealed a couple of cons, one of which is its not-so-competitive 2.2GHz eight-core Snapdragon 660 processor -- some of the leading eight-core smartphones run on chips clocked at around 2.5GHz. It also comes with a 128GB internal memory that can be expanded by only up to 256GB , whereas some of its upmarket contemporaries support up to 512GB's worth of top-up storage. On the flip side, its 6GB RAM sounds adequate, especially for a phone with its kind of imaging perks. Also among the X71's pros and cons is a 16-megapixel f/2.0-aperture selfie camera and Nokia's proprietary OZO 360-degree sound technology . Up front, the X71 rocks a phablet-class 6.4-inch display sitting on a 19.3:9 aspect ratio, a 500-nit maximum brightness level, and a 1080p Full HD+ resolution. Its 93 percent screen-to-body ratio sounds promising as well. Powering its screen is a 3500mAh battery , which we do not find that impressive, at least compared to the 4000mAh cells boasted by a few tantamount models from competing brands -- note, though, that it comes with a respectable 18W fast-charging system. Encasing this Nokia model's pros and cons are back-to-back 2.5D 2.5D hyperboloid glass panels, a metal frame, and an Eclipse Black finish topped off by a breathing light effect on its power button. With that said, Nokia's X71 is a high-tier phone that does not go all out on hardware, but flexes some premium-class muscles when it comes to photography and video-recording.